"Dr. Yu is the best Sinus doctor in Orange County!" "Dr. Yu is my third ENT and I plan on keeping her for the long run." "I will be sending all my friends and family here. 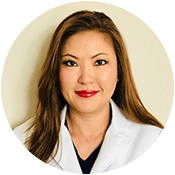 10/10"
"I'm thankful for all of Dr. Yu's hard work and what her team has done for me." "I really appreciate Dr. Yu being up to date with the latest treatments available." "Dr. Yu has been a godsend to me and my family. Can't thank her enough for her services!"